... our first stop was the Zoroastrian Fire Temple, an oddly ordinary place in a utterly nondescript section of Yazd. More than anything it reminded me of the Jewish area we had visited back in Hamedan, a world unto itself, surrounded by a sea of Islam. Zoroastrianism is often mistaken for a fire-worshipping religion because its adherents use flame as their symbol (like Christians use a cross). Instead fire is used because it’s the most respected of the traditional elements in Zoroastrianism – warming homes and cooking food. The religion is monotheistic, one of the world’s first, and believes in a final judgment day. The flame we saw in the Temple had been kept burning continuously for 1600 years, even when transferred from one temple to another. 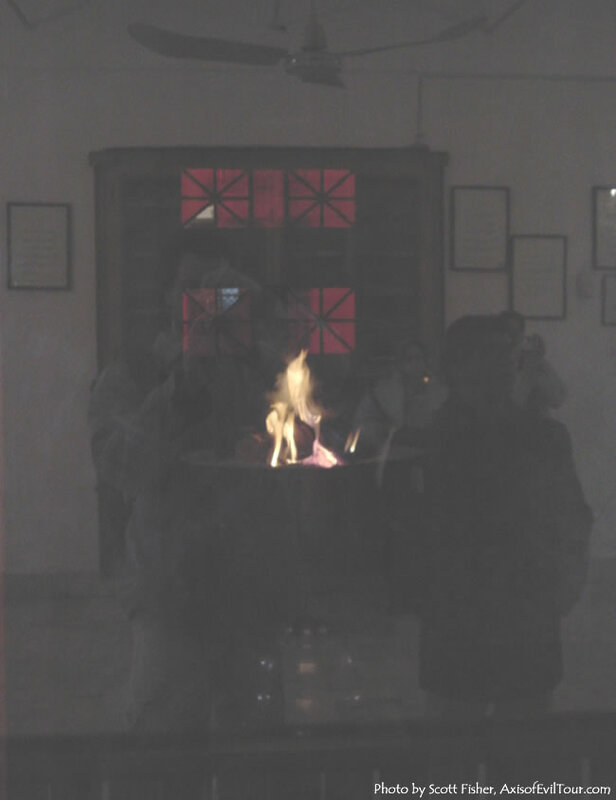 Keeping this fire burning inside its glass enclosure was one of the most important jobs of the local priests and served as the primary draw for Zoroastrian pilgrims coming from around the world.